It’s interesting living in two worlds – one being the world of teenagers and adult children and the other being the world of preshoolers. In some ways, the worlds are so very different and, in some ways, remarkably similar. I’ve also noticed that the preschool world that Esther lives in is different than the preschool world my older children lived in. I’m not sure its all better, either. One thing that I’ve noticed (and I feel like I really need to guard against) is that if we’re not careful, Esther could have some kind of electric device in front of her face all day long. Back “in the day” if one of our children wanted to play an electronic game we would have to set them up at our desktop computer and put a disk in. Now, we can just whip out the phone (well, not my dumb phone) or an ipod – we don’t have to be home or even inside. Our children can entertained, or distracted or “kept busy” all day long. It’s not a good thing. There are games and apps that can do anything. Don’t want to get the kitchen messy with finger paints? There’s an app for that. Want to teach your children responsibility of taking care of animals? There’s an app for that. If these are the main experiences that kids have for painting or learning responsibilty, we’ve done them a disservice. 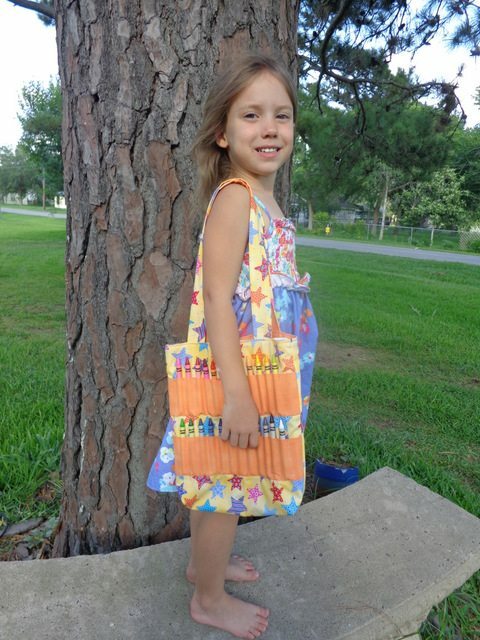 So, in order to limit the tempation to keep Esther “entertained” when we’re out and about, I made her a crayon tote bag. And I took photos so you could make one too. 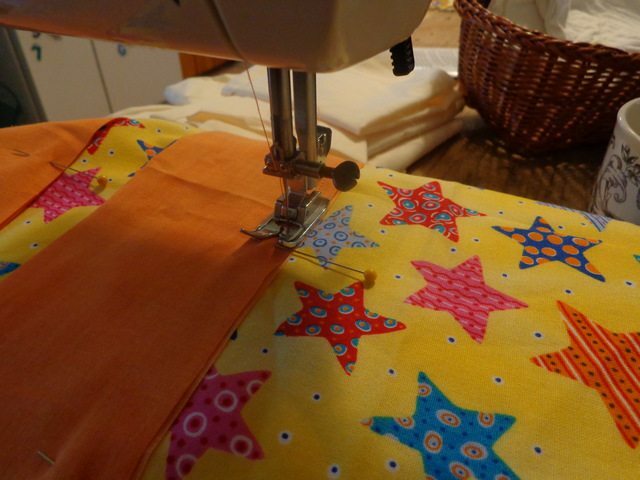 I bet it will only take an hour, so get some fabric, get your machine out and start sewing. You’ll be glad you did. Fold each of the 5″X12″ peices in half lengthwise so each piece is now 2.5″ X 12″. Pin one 2.5″X12″ piece four inches up from the bottom of the on the front piece. Then pin the second one eight inches up from the bottom. Make sure the raw edges are closer to the top and the folded sides are closer to the bottom. 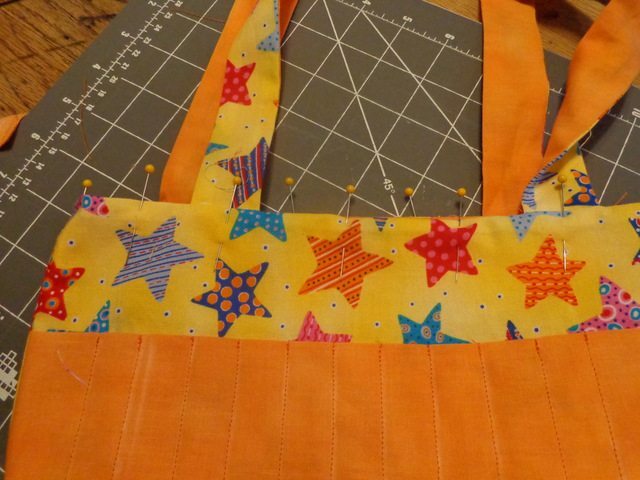 Using a quater inch seam (just line the fabric up with the right edge of your foot) stitch the raw edges to the front of the bag. The front should now look like the photo on the left – the crayon holder are like little flaps. Fold those flaps up and iron the seam. Now, measure in 1.5″ from each side and make a line with a piece of chalk. You can get all fancy and use a fabric chalk pencil or you can do what I did and just grab a piece of chalk off the kid’s chalkboard. 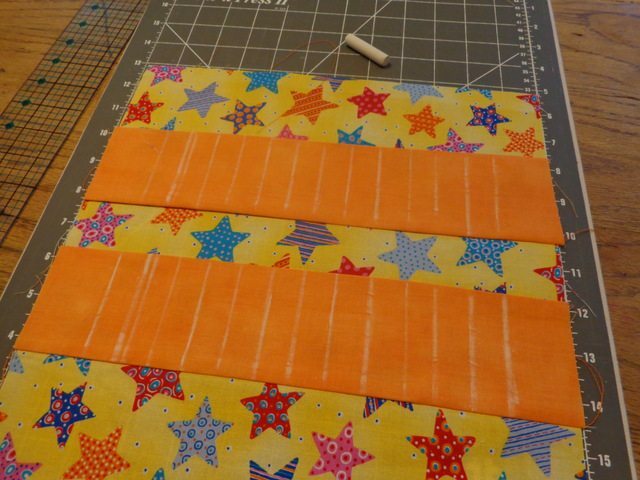 Now, make 11 more lines 3/4″ apart between the two you already made. They don’t have to be perfect but if you notice that one is much bigger than the others, just adjust it. 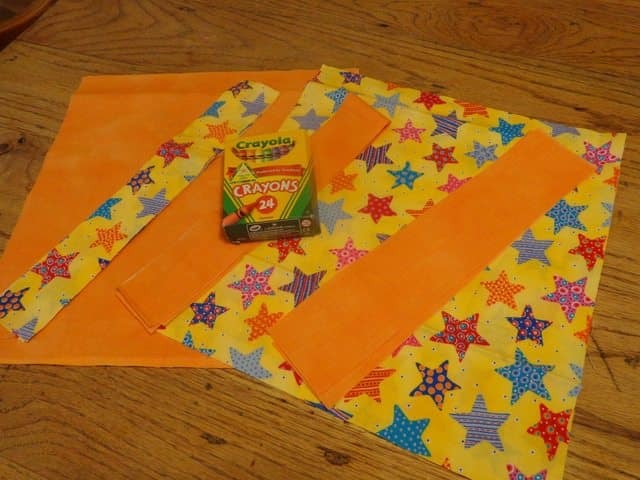 Next, stitch over the chalk lines to make your crayon pockets. Be sure to back stitch at the beginning and ending of each line to lock in your stitches. 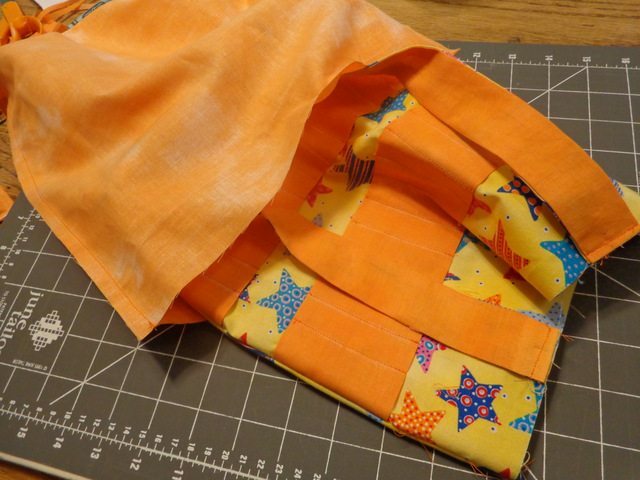 Lay the other outside bag piece on top of the first one with the right sides of the fabrics together. Pin both sides and the bottom. Leave the top open. Stitch the 3 sides. I really like the look of boxed corners so I did that on our bag. All you do is line up the side seam to the bottom seam and it will come to a point. Pin it down like I did in the photo. Now stitch to make a triangle on the end. I just line up the edge of the fabric (where the point is) on the edge of the silver part of my machine and do that for each side. I know, it’s very technical…. 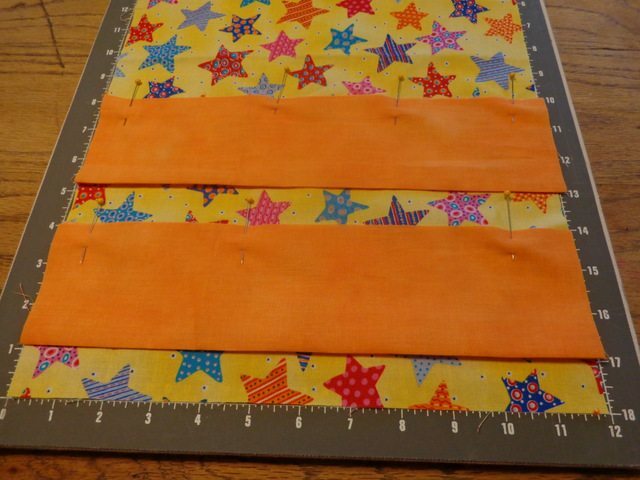 Now, you’re going to make the lining by putting the two 12″X13″ pieces right sides together and stitching around both sides and the bottom, leaving the top open and then box the corners. However, DO NOT sew about four inches of the bottom of the lining. You want a hole in the bottom of the lining – trust me, it’s important. Now to make the straps, and let me apologize right now for not having photos of this process. I was supervising dinner preparations while I was making this. Probably not a good combo. But you guys are sharp, so I’m sure you’ll be just fine. If you need photos, I have them on this post, but instead of using two pieces of fabric I used one wide piece and folded it in half. 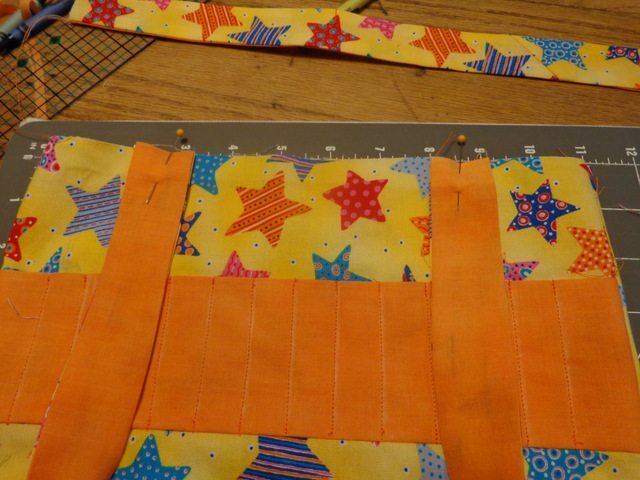 Put 2 of your strap pieces right side together and stitch down each long side. Do the same with the two other pieces. I chose to have my straps two different fabrics you don’t have to. Once that is done, start turning the end of one side down and start pulling the insides out. When all the insides are out, lay the piece out and iron it flat. Now, take the outside of your bag and turn it right side out. Take one strap and pin it about 2″ in from each side. Make sure you only pin it to the one side – your top should still be open. Then pin the other strap to the other side. 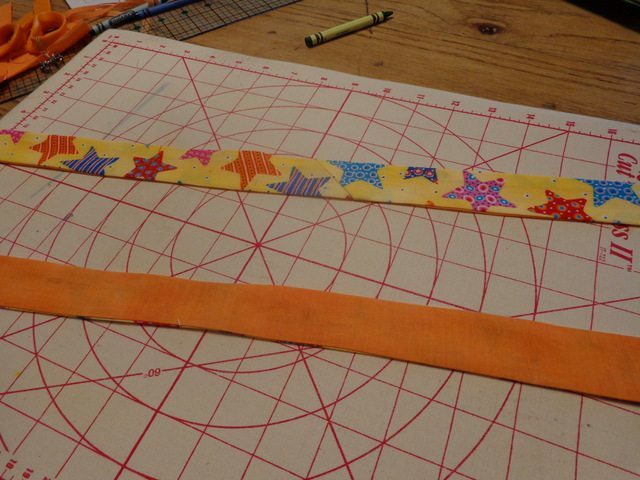 Stitch the straps down – all four edges – and pin the strap out of the way so it’s no hanging loose. Now, take the lining which is still inside out and put the outside of the bag in it. Pin the lining to the bag all around the top. Now, stitch around the top opening – there should still be an opening ;-). After the hole is stitched, push the lining into the bag. 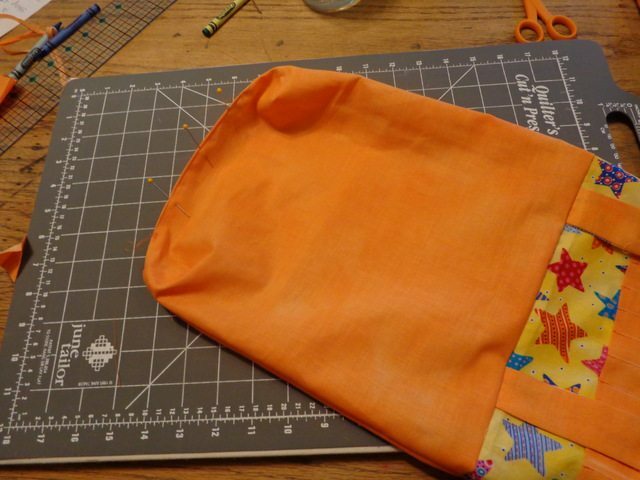 You can iron the bag opening, but I like to pin the lining down and top stitch (1/4″ seam or less)around the opening. Tell me, do you struggle with the amount of electronic use your kids have available to them? How do you balance that? I’m really confused (and sad) because I cut my body pieces 11×12 like the directions say and then getting further deeper you say to pin your 12×13 pieces right sides together and looking at your pictures your body is 12×13. All my fabric is cut too small now 🙁 and of course I cut all 3 bags’ worth of pieces so I could sew all at once. You may want to fix that so others don’t waste time and money like I did. oh my, I am so, so sorry. I’ve fixed the post and I appreciate you letting me know my error. Please know that you can still use your fabric, your bag will just a bit smaller. There is plenty of room in the final product to allow for it to be an inch shorter and an inch narrower. There are 28 slots for crayons and a box of crayons comes in 24. 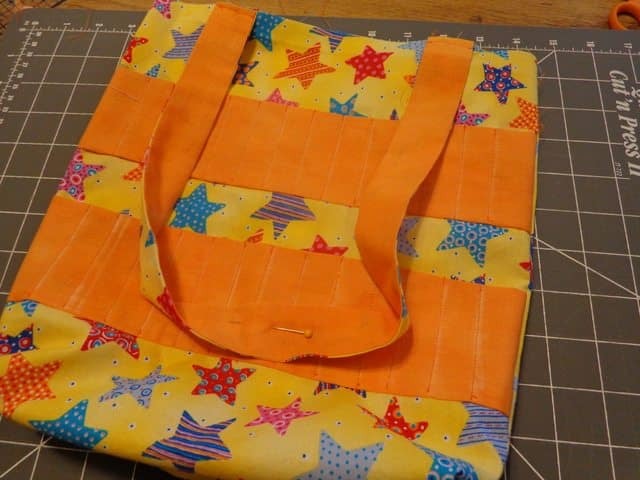 Even with an inch narrower you should be able to get a coloring book in the bag as the finished size will be 10.5″ and a coloring book is about 8.5″ across. Again, I’m really sorry for the error and I appreciate you letting me know. Question-Have you used a light weight batting to give the bag more body? Hi Andrea, I haven’t but but you could certainly try it. If you do, let me know how it turns out! I use iron in battin for the bag body. It really makes a sturdier bag. 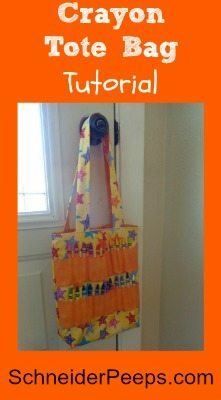 I just finished making one for my darling granddaughter; I used fusible batting to give the bag more body. 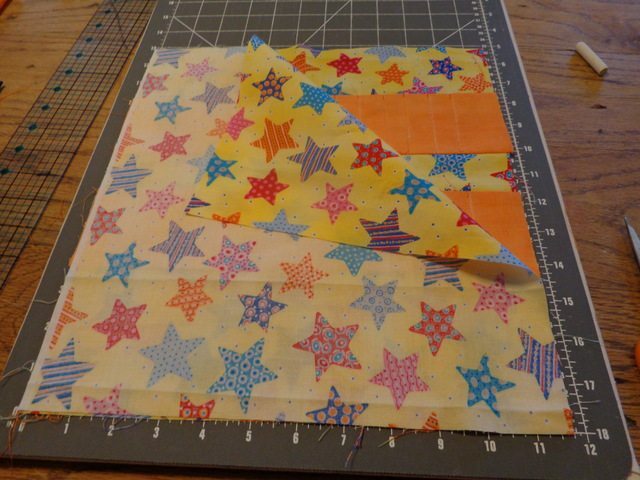 The next one I make (for grandson) I think I’ll use fusible batting or interfacing in the straps. But I’m real pleased with how it turned out! Good tutorial! Need to get a bigger box of crayons, though! Great suggestions! Thanks for sharing them. I do not understand computers so any help is appreciated. Is there anywhere that I can purchase the pattern. Hi Gerry, You can highlight all the text and then print “selected text.” I don’t have this as a printable pattern at this time. I DO NOT SEE WHERE YOU SEWED THE SLOTS FOR THE CRAYONS. WHEN DO YOU DO THAT? Hi Jean, you’ll stitch over the chalk lines after you mark them, before sewing the two bag pieces together. I’ve added that step into the tutorial. Thanks for catching that!